So I've installed (1) rebuilt taurus and (1) rebuilt t-bird rear caliper on my 86(cheapest R-L pairing on rockauto), as well as a remanufactured 86 BMC. I've replaced the proportioning valve with a union fitting. Stock calipers up front. We've bled the brakes numerous times and we can still turn the rear rotors by hand when the brake pedal is pressed and held(single time). If the pedal is pressed two or three times and then held, the rear calibers grab. Any ideas? Is it possible that the 86 master/booster combo doesn't move enough fluid for this set up? Air still in the lines? Is it possible we have the calipers reversed R to L? Remove the 2 bolts holding the caliper to the adapter. Do both sides. Rotate the caliper towards the front of the car, still centered on the rotor. They won't fall off. Re-bleed the brakes. I "gravity bleed" first, typically, that's all that's required. Not always. When you get a firm pedal, and no bubbles, rotate, bolt up and test drive. As with all bleeds, DON'T push the pedal to the floor repeatedly, if at all. It pushes the piston/seals into uncharted territory, unless the MC is new. Short strokes are all that's required. Sandmerchant wrote: Anyone else have this problem or know the cure? Did you do what was suggested and still have the issue? The T-Bird/Taurus calipers have the bleeders below the inlet when mounted. This requires them to be dismounted and rotated to ensure all the air is bled. Also, they use a 45mm piston, which is about 9% larger than the Sierra/Scorpio rear (43mm). I have the T-bird rear caliper setup. 1. The calipers do get to be reversed from the t-bird I believe this will enable the parking brake cable to work as well as position the brake line connection high. 2. The brake lines then connect to the caliper via a "Banjo bolt" with a bleeder fitting - this is the bleeder used to bleed the system. Best mod I've done for my xr! 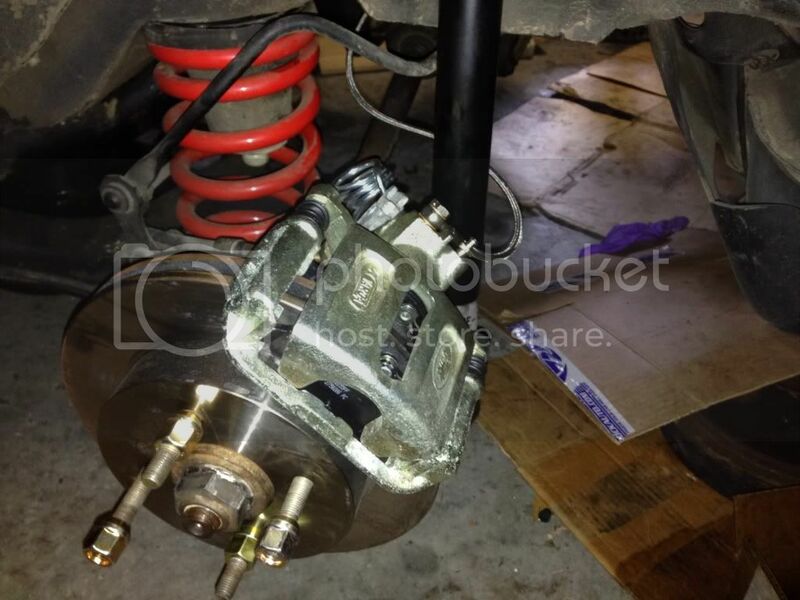 JimG wrote: I have the T-bird rear caliper setup. 1. The calipers do get to be reversed from the t-bird I believe this will enable the parking brake cable to work as well as position the brake line connection high. I saw thise a while back. Apparently they are popular for use on motorcycles. Those definitely make sense with the varga caliper in our application. Where did you find that particular banjo bolt bleeder? I've looked but couldn't find any in the correct thread. I just installed them on my car and we just bleed them from the banjo bolt. Put a bunch of paper towels around it when you crack them open, they make a mess.